In my Online Panel NET review today I will be asking: Is this just a scam, or a legitimate extra income site? I recently got notified that there is a new survey panel opening up online. As someone who regularly checks out survey-related sites and extra income opportunities, I thought I would go and check it out. My initial impressions were, that it looks a lot like Swagbucks – which is my favourite site of this type. So, I wondered if this could be a new worthy competitor? This is still a really new site so, time will tell if it stays on my list. Let me know what you think! Overall Rating: From my experience so far, I’m marking this site as legit and I have had a good experience with it so far. However, I want to give this a little time and I want to reach the payout threshold, so that I can show you guys that it does pay out. The payout amount for this site is $10 and they pay via PayPal – Sign up here! What Is Online Panel NET about? Online Panel is an extra income site, where you can make a small amount of money in a variety of ways. You initially make points for certain tasks and these points can then be exchanged for cash into your PayPal account. Micro Jobs, (none available when I checked it out, but that could be my location). Completing offers will tend to involve things like, free trials, entering sweepstakes and often joining other related sites, (other paid online survey sites). If you do enter sweepstakes via sites like this, I’d recommend using a specific email account just for entering things like that, as you can get an increase in SPAM, (just my experience). I prefer doing other offers, (both paid and free) – But do always check the T&Cs; before you sign up for a free trial/paid offer, or enter a sweepstake offer. What offers are available to you will depend on your location. I’m in the UK and I was pleasantly surprised that there were still actually plenty of offers there for me, (sometimes this isn’t the case!). A free trial for the Gourmet Society. Joining Beer52 for a free case. All the offers you see will be worth a certain number of points but every single one will have unique instructions. It’s important you follow these instructions if you want to receive points. I decided to join Beer52. This was a paid offer, (not all offers are free, so make sure you double check that). 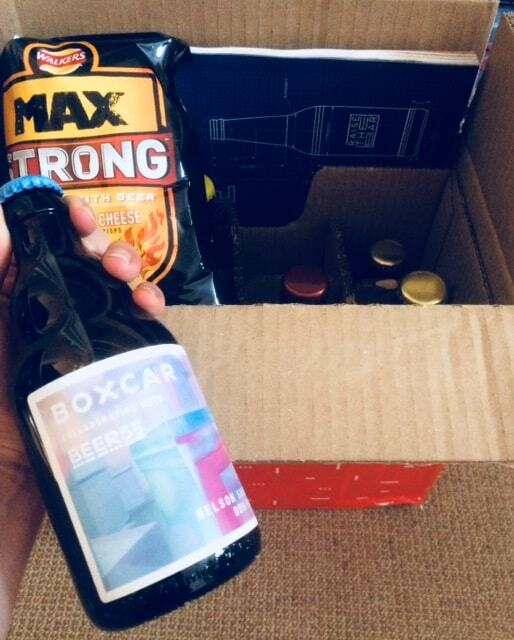 I just needed to pay a postage fee and get a selection of 8 beers sent to me – for free. This would automatically become a regular order, but I will be able to cancel within 24 hours if I no longer want to continue with the regular orders, (and you will still get your points). This company had a 4 star rating on TrustPilot, so I felt confident giving them a go. As I signed up for the trial, I saw a little confirmation on the website that my details had been tracked and my points tracked. My points didn’t show right away – I thought it could take up to 24 hours, but actually they showed up about 5 minutes later! Update: I got my beer a few days later and it came with a nice snack too…. 8 beers in total. See below! I noticed later that, when you go to an offer, it actually tells you how long you’ll need to wait to get points in your account. With some of the offers I tried, it said I wasn’t eligible for them. This could be based on location. I took another offer – free this time – which was to join rewards TV and complete 2 trivia games. I was awarded more points within around 5 minutes. This section is pretty good, as you can earn points simply by downloading some of these Apps. Many of the instructions simply ask you to, download + install + open app, in order to receive points. One difference is with some of the game apps, you’ll need to play to a certain level. One of the first game apps I opened, said you had to play until level 6. Which is fine, if you enjoy game apps. Click directly on the offer and a pop up appears that will give you the full details. So, now on to my least favourite way to make money on these sites, (usually). There are three main survey sections to check out here – including: Best opportunity, most popular and Plenty more. I went to the “best opportunity,” section. I went to a survey that offered 420 points. Now, 500 points is 50 cents, so it’s a little less than that in reality. Not a lot of money, but it depends on the length of the survey. I kept being directed to various surveys on Global Test Market, (another well-established survey site). However, I constantly got thrown off for not qualifying. Unfortunately, this happens with a majority of online surveys. It can take a long time just to manage to complete a single survey and then you may have only made 50 cents or less. The only two survey sites I’ve found that don’t seem to screen out, (at the time of writing) is YouGov Surveys. and Prolific. In any case, after around 5 different surveys that I got chucked off, I was able to answer a survey. The survey I finally got access to was actually really enjoyable – it involved shopping in an online store, which I’d not experienced before. It made a change from the usual boring surveys I’ve taken in the past. When I checked back to my main dashboard, I’d already been awarded my points. It must have taken around half an hour to actually complete a survey though, as I kept being thrown off and sent to another one. The actual survey I finally did say it would take around 20 minutes, but it actually only took around 10 – which was a bonus. I also checked out the Micro Job section here, but there wasn’t anything available to me at the time of writing – this could be my location, (as I’ve found this to be the case on other sites also). You need 10,000 points to cash out at this point in time – this actually isn’t all that bad. Because 1000 points equal 1 dollar and it shouldn’t take long to make $10. But it will depend how long you spend on the site and whether you go for things like; downloading Apps, or completing offers. While some sites have a lower payout threshold, (which is preferable) there are many others which have much higher thresholds! So, $10 isn’t bad. Take a look at the site and check out which offers have the highest rewards; just be sure to check the T&Cs before you go ahead with it. With most survey sites, you have to request a payment once you reach the threshold, (or longer, if you want to save up your points). In this case though, you don’t have to request payment. You will simply be paid $10 into your PayPal account when you reach 10,000 points. Some people would rather keep saving their points until they had something more substantial, but it appears that you cannot do that at this point in time. You could just keep the cash in your PayPal account though. That’s the other thing, you do need a PayPal account to cash out and there are no alternative payouts available – for example; lots of sites like to give various gift card options. However, – important to note: This site has a premium membership feature that automatically comes into play after your first initial payout. I’m told by Opinion Panel that this will include: additional loyalty points, faster payments and additional reward options. Free to join – simple to sign up. Good clean site, easy to navigate. A variety of different ways to earn – not just surveys. A variety of offers/apps/survey offers. Worldwide users welcome – although availability of offers and so forth will vary depending on location. Premium membership – after your first cash out, you get extra perks, such as more points, additional rewards. You need PayPal to get paid. No gift card options, (once you cash out once, there are then meant to be additional options). Nothing in micro jobs, when I checked it out, (this could be coming, as the site is brand new). Online Panel NET Review: Or Legit Extra Income Site? Having signed up and checked out this site, I found it easy to navigate and plenty of options available to make a small amount of money online. If you’re looking for another extra income site to join, this is a legitimate site with plenty of options to earn. Once you’ve cashed out once, there will also be additional perks, as you automatically become a premium member. Just remember, you’re not going to make loads of money doing this, it’s just a way to make a little extra money each month, by doing some things you may enjoy doing anyway. If you’re already interested in online surveys and getting paid for offers and trials online, then you may want to check it out. If you came online actually looking to make more of a part-time, or even full-time income online; you’re not going to get there from doing micro tasks, or online surveys! For an extensive list of alternative options – check out my 40+ ways to make money online. If you’re interested in how I make money from running a blog – this is where I got started. Do you have much experience with survey sites online? Let me know in the comments! Good find! I like Swagbucks, but it is limited by location, so it’s nice to see something that you can use elsewhere. Personally, I feel like $10 isn’t terribly high, and it’s enough to do something with once you get paid! I’ll definitely be checking the new site out. Thanks! Yeh $10 is pretty good for a pay out threshold I think! Thanks for stopping by and leaving a comment! Hi Nat. Thank you so much for the review on this site. I myself like surfing the net always on the look-out for sites like these so I will definitely be checking this one out. I am a member of Global Test Market and their surveys are pretty easy to fill. So the redirect to that site won’t be an issue for me. I will make sure to check out all the options on the site to see what would be the best fit for me. Once again, thank you!